New Moon Farm was created in 1999, though it didn’t have a name, or a public face then. 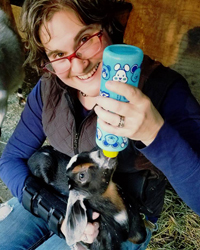 Founder Ellen Felsenthal was working at the Woodland Park Zoo in Seattle, in the Family Farm. 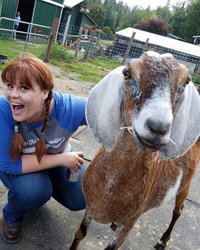 One of the petting zoo goats, Ziggy, developed a skin condition. His hair began to fall out, first on his face and ears, then on more of his body, and his skin was rough and scaly. 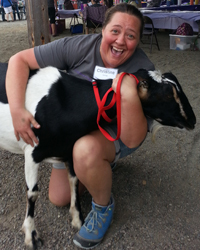 No one wants to pet a bald goat, and so Ziggy had to leave the petting area. The Zoo’s plan was to euthanize him. Those who loved and cared for Ziggy didn’t think this was an option. When no other alternatives were presented, Ellen offered to take Ziggy home to live with her horse. A trip to the vet and some simple tests showed that the hair loss was due to an allergic reaction. A short course of medication was all it took for Ziggy’s hair to grow back in soft and shiny. For 14 years, Ziggy acted as the farm’s ambassador, greeting guests and welcoming new arrivals. Of course, it soon became clear that Ziggy needed to have another goat around. And so Nigel, a Kinder Goat, joined the family. 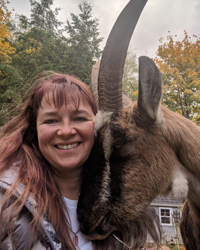 Ellen was active in the world of animal rescue, fostering dogs and cats for various organizations, and working closely with a local horse rescue. Often, there would be a situation where a goat needed a home. Unfortunately, there was no place to send them. Since she already had goats (and the facilities needed to keep them), they went to Ellen’s place. 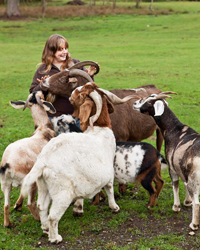 Over time, as word got out that she was taking in goats, the calls started coming in more frequently. While there were many horse, dog and cat rescues in the region, there was no organization willing to work with goats. Ellen decided that there needed to be a sanctuary dedicated to these intelligent, personable creatures. 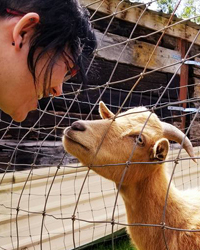 Ellen began to look for homes for some of the goats, recognizing that if she kept all of the goats and sheep that came into the rescue, she would soon have to stop taking any in. In March of 2003, Ellen purchased a 6 acre farm in Arlington, and New Moon Farm was formally founded. In 2008 we received federal 501(c)(3) non-profit status.